View the product image above and check out the precise details and craftsmanship put into this remarkably durable Western Spurs. This Ladies All Purpose Silver Embellished Western Spur is one of our best selling items. Made by Robart the western spur is great for everyday use. It features engraved silver overlay with rowel. 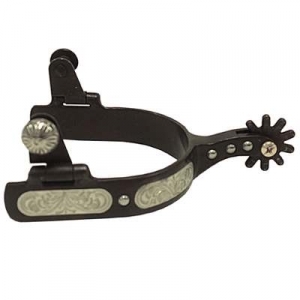 Our ladies spurs are an extraordinary pair of spurs that will provide maximum comfort.